As a small business, it is easy to get lost amongst all the online marketing options available today! In this blog post, we’ll be talking about some of the pros and cons of working with a daily deal website. There are many companies out there to work with, and you are no doubt aware of the bigger names such as Groupon and LivingSocial. The Run-Down: A daily deal provider will send out a deal you are offering to their member base, usually in the form of a daily e-mail. The deals being offered need to be sizeable and exciting (usually representing a 30-70% discount on your normal prices). People buy these deals upfront, and voila! Instant sales! The Upside: Running a daily deal can get your shop in front of a lot of potential new customers very quickly, at no immediate cost for you. In fact, you are getting PAID to run the daily deal, as all those customers are buying those coupons upfront. This is in contrast to most other forms of marketing, which require some upfront marketing costs to get going. Let’s say you offered a $100 product for $50, a 50% discount. The customer is paying $50 through the daily deal provider. Of that $50, only 50% will reach your pocket, or $25. That means that for $100 worth of products sold, you only received $25. Depending on your margins, your business may not be able to sustain such huge discounts. Daily deal websites are a great way to get customers to your store, but not a great way to RETAIN those customers. You need to convert those customers into returning customers, who will pay full-price the next time they come to your store. As a business operator, you can’t afford to run your business by permanently offering 75% discounts (we advise every business to do the math before participating in a daily deal, as the actual revenue received may be much lower than you originally anticipated). 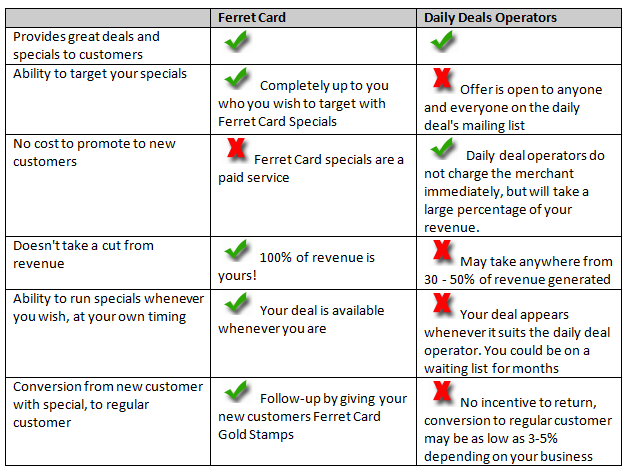 Should you decide that a daily deal offer is a good solution for you, we would strongly recommend for you to supplement that offer with Ferret Card to try to convert as many new customers as possible into return customers. Give them Ferret Card Gold Stamps to help lure them back to your business!